Nothing was going to stop the Rossies from playing Sunday's Connacht SFC final against Galway in their beloved Dr Hyde Park. But it has required a battle of wits and a battalion of volunteer workers to ensure that Roscommon GAA's recently maligned home received the green light from the Connacht Council. And even that came with multiple caveats and conditions attached, of which more anon. An idea of the hard work involved can be gleaned from the following county board WhatsApp message, sent last Friday: "Volunteers from clubs are required in Hyde Park this evening from 6pm to 9pm. If anyone is available to help out please bring spades etc. Please spread the word." Why all the hassle? Put simply, Hyde Park's swish new playing surface (reopened last year to replace the previous bog) isn't matched by suitably up-to-date facilities for those watching. 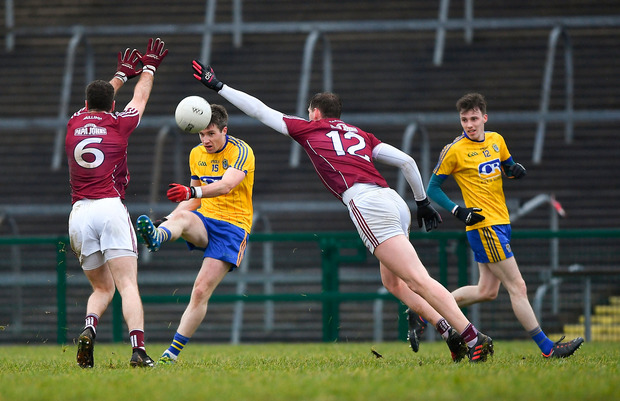 Roscommon chairman Seamus Sweeney admitted to the local media last week that "in excess of €3 million" is required to "bring it up to the required standard". And that's why, initially at least, Connacht chiefs appeared so hesitant about its suitability. Kevin McStay was having none of it, though, after their semi-final win over Leitrim. At that stage, the second semi-final had yet to happen but the Rossies were "due" a home clash with Galway, red hot favourites against Sligo. "We are in the Connacht final, we have the home venue," the Ros' boss declared. "We'll certainly be turning up in the Hyde. I hope someone else is there to meet us on the day and we'd be very, very absolute about that." His county board wasn't quite so absolute a few days later. "Roscommon GAA fully accept the venue of the Connacht final will be decided by the Connacht CCC and this will be done when the winner of the Galway v Sligo game is known," the board stated on May 30, secretary Brian Carroll adding that he had held a "very constructive" meeting with his Connacht counterpart, John Prenty, with another planned for that coming weekend. Ultimately, all's well that ends well. The Rossies got their Connacht final - at a cost. Hyde Park received the go-ahead with a raft of conditions too numerous to mention, but including the following: capacity confined to 18,870; the final would be all-ticket, with no tickets available on the day; Roscommon would bear the costs of a scanning system to be introduced especially for the final; ground rent agreed at 5pc (reports suggest it's usually 10-20pc). And beyond Sunday? Hyde Park shall not be eligible to host a future Connacht final until the following works are completed: new entrance on the Athlone Road side, permanent metered turnstiles, modern-standard dressing-rooms, permanent male and female toilets, tarring of roadways and areas behind the main stand. Likely cost? Three million. "We will require the full support of the whole county to achieve it," said Sweeney. Maybe that's what the spades were for: a dig-out!